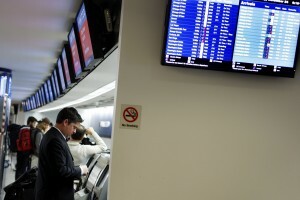 WASHINGTON — A Senate panel has approved an aviation policy bill Wednesday after a partisan fight over whether airlines are unfairly gouging consumers with fees for basic services like checked bags, seat assignments and ticket changes. The Senate commerce committee approved by a voice vote a bill to continue the Federal Aviation Administration’s authority to operate through Oct. 1, 2017. That authority is currently due to expire on March 31. The committee’s Democrats led by Sen. Edward Markey, D-Mass., tried to add a provision to the bill to prohibit airlines from setting unreasonable fee prices and direct the Department of Transportation to establish what is reasonable. The amendment failed on a tie, party-line vote. Consumers are being “gouged” by excessive fees, but they don’t have any choice but to pay them if they want to get to their destination, Markey said. The problem is especially problem severe in rural communities served by only a single airline, Democrats said. “When there is no competition, there is bad behavior,” said Sen. Claire McCaskill, D-Mo. Republicans said the provision would be burdensome for airlines and market forces should be allowed to determine fee prices. “I don’t think having the Department of Transportation decide what is reasonable or unreasonable is a correct route to go,” said Sen. John Thune, R-S.D., the committee’s chairman. The bill requires the department to standardize the way airlines disclose fees for basic services so that passengers can more easily comparison-shop the full cost of flights. Missing from the bill is any effort to wrest air traffic control operations from the FAA and spin them off into a private, nonprofit corporation. An FAA reauthorization bill that would have privatized air traffic control services was passed last month by the House Transportation and Infrastructure Committee on a mostly party-line vote with Democrats unanimously opposed. The bill has the backing of the committee’s chairman, Rep. Bill Shuster, R-Pa., and the airline industry, but it was sidelined by House leaders in the face of opposition from other powerful GOP lawmakers and influential segments of the aviation industry.